I gotta say… it felt like a good 3 years of heart, passion, effort, activity, accomplishments were crammed into one… 2017. This was one year in our journey that I will always remember with fondness. Met a lot of cool people, and made new friends. Together we created. And we laid the foundation for the eventual culmination of a really cool feature film.. Swamp Killer! 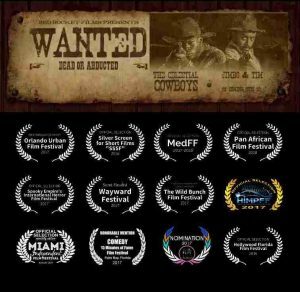 Our sci-fi comedy western WANTED: Dead or Abducted has been accepted in at least 12 film festivals now, including the Pan African Film & Arts Festival in February. PAFF is known as “America’s Largest and Most Prestigious International Black Film Festival,” drawing over 200k people to Los Angeles each year. USA Today selected PAFF as #3 in their 2015 list of 10 Best Film Festivals in the U.S. 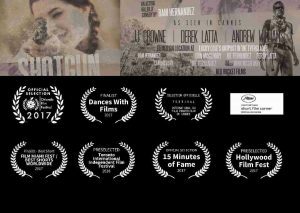 This little gem of a film also won Best Innovative Short at the Orlando Urban Film Festival, as well as an Honorable Mention for Comedy at the Palm Bay Film Festival. It was also nominated for Best Comedy at one of the only pure Western film festivals in the world, The Wild Bunch FF, just outside of Tucson. Our swamp comedy heist film SHOTGUN keeps on trucking, picking up a few more film festivals since we last spoke. In just a few months time, Swamp Killer: A Grindhouse Trailer was selected in 11 international film festivals including Chile, Sicily, India, Venezuela, Barcelona, UK, Rome, Oregon, and I forget where else. It won five Best Trailer awards and one Finalist award. Never have I gotten anywhere close to this type response from any of the past trailers I have submitted. First order of business… Lock the damn script down! In 2017 we put the proverbial cart before the horse. You see.. most normal people would first write a damn screenplay, THEN set out to produce a handful of test scenes and an official concept film trailer. But as my family can attest… I can be far from normal. I do have a treatment (outline). That’s a good start. And I will have the actual script locked down by March. So until then I’m a hermit. Writing in my cave by day, letting off steam at my Karate dojo by night. One positive… I now have a great sense of the characters in the film. I found a group of core actors that play extremely well off each other. Considering the unexpected positive film festival run of the concept trailer, you can say the proof is in the pudding. Huge kudos to Michael Jacques, one of the leads (and Assoc. Producer) in the film. 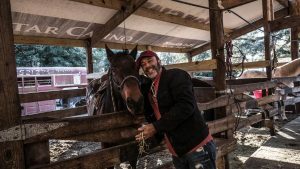 He runs one of the better acting studios in South Florida. Hence, I’ve been exposed to a lot of great talent. I’ve been to his class several times and I’m always blown away. I can honestly say that if you’re an actor, or dream of being an actor, you’re kidding yourself if you’re not practicing and studying your craft on a consistent basis. I see that now. I see the difference and the impact it makes. If you’re South Florida talent, please go check his class out. Monday nights at 8 in Fort Lauderdale. I think it’s like 20 bucks. You won’t regret it. The American Film Market in Santa Monica this past November was great. Learned a lot, and met some key industry people. Everyone loved the SWAMP KILLER concept trailer. Met one producer/investor from the UK that wanted to put Swamp Killer in their current slate of horror films. Next stop – Cannes Film Market in May!